Absolute is a brand that has been a favorite amongst football collectors for a while now. It's premium foil cards combined with very strong memorabilia and autograph content is very enticing. This latest version of Absolute delivers the same formula as it has in the past. Collectors will get four 'apple turnover' boxes per hobby box. Each will contain a hit! The 2013 Absolute base cards stand out in both traditional and new ways. These base cards retain the Absolute signature of very refractive foil. Lines of light and color shine through the cards as you flip through them. These base cards are not subtle in their use of foil. Not only is the entire card shiny, but so is the golden Absolute logo. And Absolute makes no apology for its foil excesses! Adding more 'non-subtly' this year are the player photographs. Wow. These photos are tightly cropped images that really get in your face. Each base photo is an extreme close-up to the player's torso area. You get real up close and personal with these cards. This unique perspective is one not seen often on cardboard. Kudos to Panini for going with such a bold decision on these photographs. I am definitely a fan of these base cards... they hit hard and make a strong statement. The back of the base card is nice... but definitely lacks the extreme design of the front. 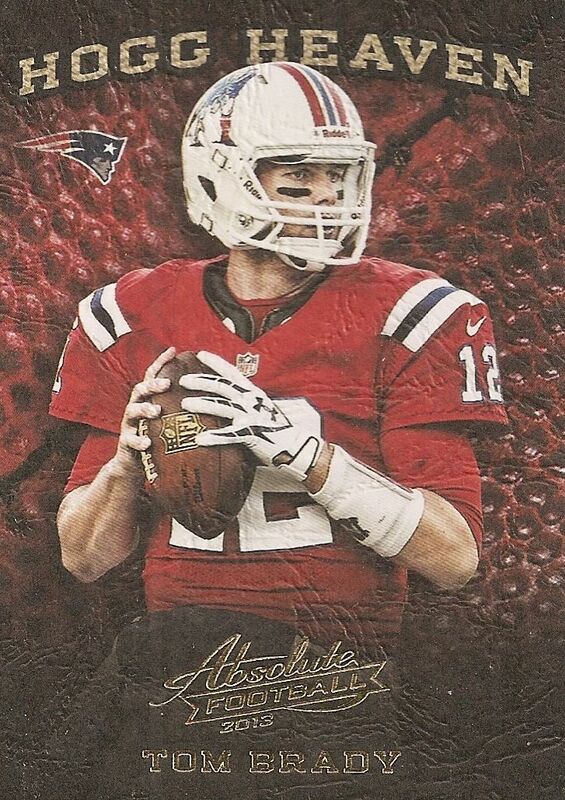 If the front of the base card were a more traditional (think National Treasures or Prime Signatures) white stock, this back would suffice, but since it isn't, I wish Panini had given the backs a more aggressive look. Perhaps black would have been a better background color than the white. I can't say this card back is bad or poorly done, but it just doesn't go well with the front design. The rookie cards make up the second half of the Absolute main set. 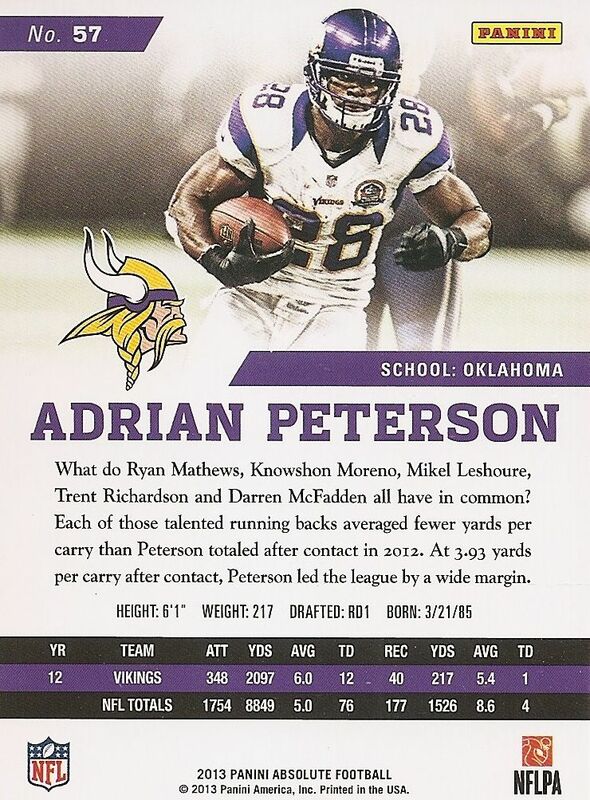 The standard rookie cards feature numbering of either 199 or 499. In terms of design, the rookies got the same treatment as the vets. Collectors are still treated to a very up-close view of the rookies. 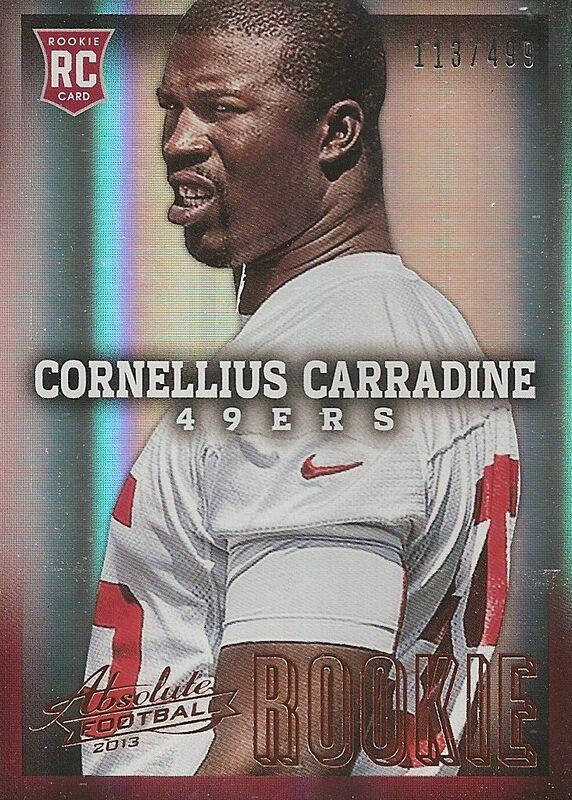 This Cornellius Carradine shot is a bit intimidating - see that look his giving you? Stay away! 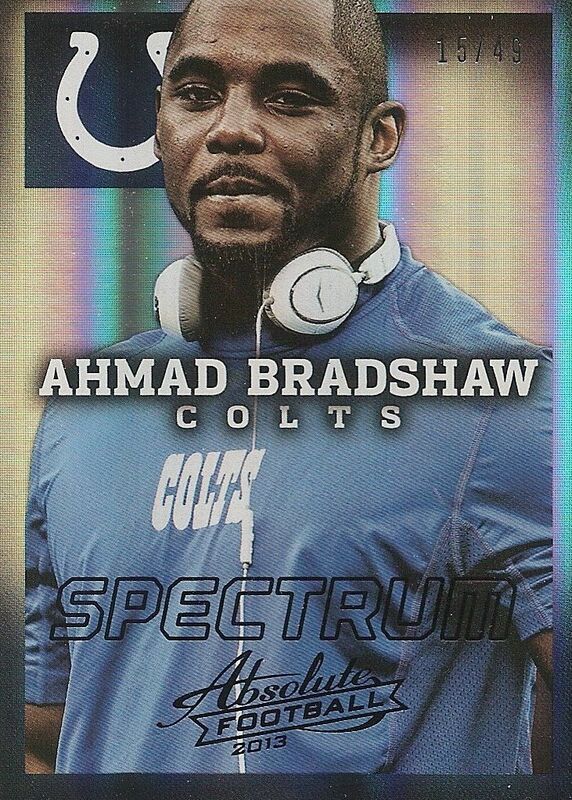 Rookie cards add the rookie card emblem in the upper corner as well as a large foil 'rookie' logo at the bottom. The final 40 cards with main set numbering are the Rookie Premier Materials cards. These cards feature pieces of jersey worn from the NFL Players Rookie Premier event on May 18th, 2013, so definitely event worn... but at least collectors know exactly what they are getting. The cards also have sticker autographs affixed to them. Each card is numbered to 299, but there are a huge amount of parallel versions with different numbering and different worn material to be found. Each box of Absolute will net you four hits. Each pack of Absolute is wrapped in cellophane rather than the usual foil packing that you see. It's not a big deal as the packs are encased in the smaller sealed boxes, but I do find the cellophane to be a peculiar choice of packaging. The first insert card that jumped out at me were the Hogg Heaven cards. This insert series has was once the insert to get back in the day - and I remember those days fondly. Back then, an insert that featured a unique texture was enough to be highly sought after. They were also pretty tough pulls too. These Hogg Heaven cards are not tough pulls as each of my packs had one in there... but they still retain the faux football feel. While the design of these cards doesn't really stand out, I am glad to see the Hogg Heaven insert set living on. 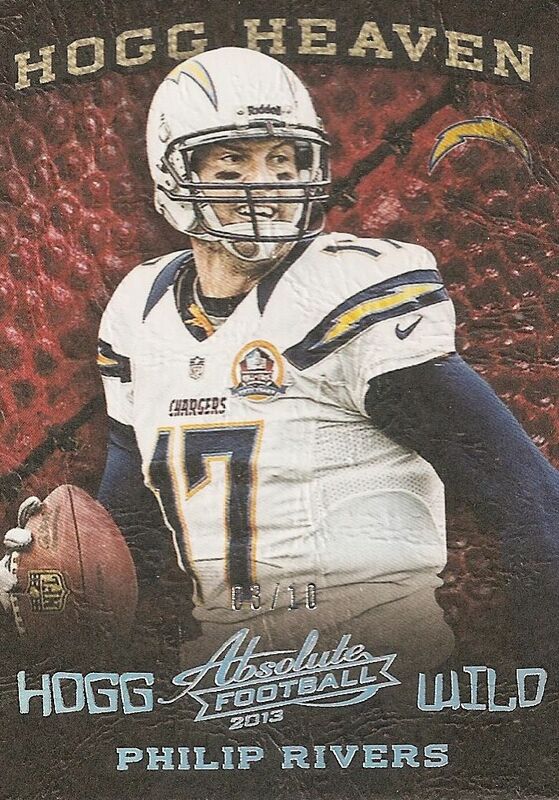 I was lucky enough to pull a Hogg Heaven Hogg Wild parallel of Philip Rivers numbered to just 10. These cards feature serial numbering and a rainbow foil Hogg Wild logo. These parallels will be difficult pulls and finds for collectors who are looking for specific players as there is a total of 90 Hogg cards in 2013 Absolute. Speaking of parallel cards, there is an absolute ton of them in Absolute. Shown above is a Spectrum Black parallel numbered to 49. It's probably not worth it trying to list out all the various numberings of different cards, but just know that you will be treated to a huge task if trying to player collect. 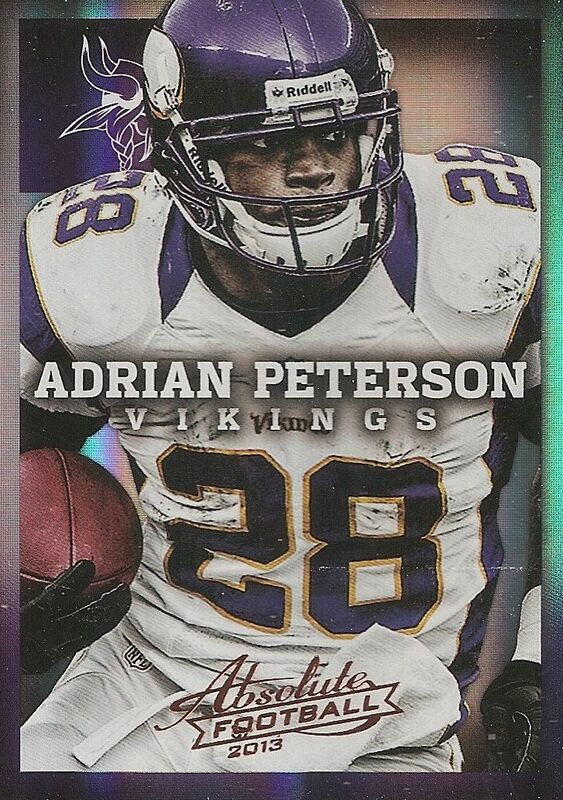 The rookie autographed cards can be considered a parallel of the standard rookie card found in the main set of Absolute. As with the other cards in Absolute, these rookie autographs are of the sticker variety. 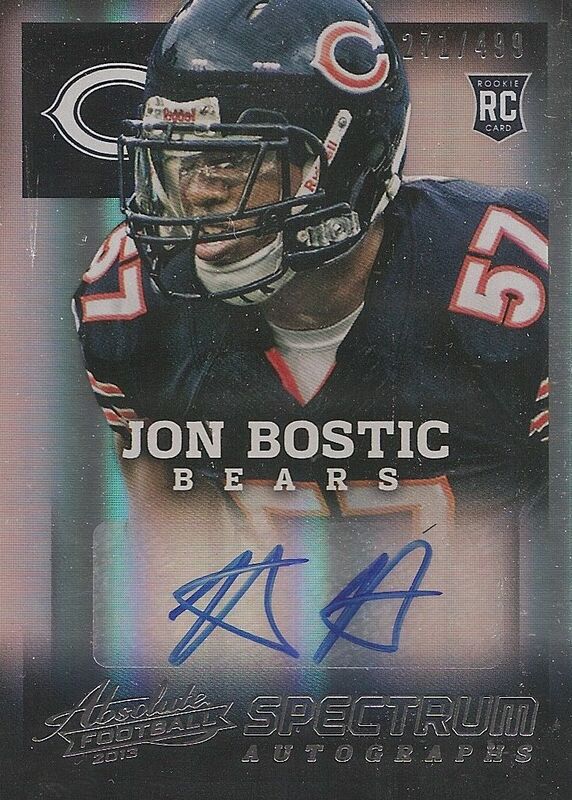 This Spectrum autograph of Jon Bostic is numbered to 499. By far the prettiest card of the box was this NFL Team Trios patch card numbered to 25. I love all the breaks and colors you can see in the NFL window on this card. This is the kind of card you just love to get when buying Absolute, and these kinds of cards are definitely findable. My final Absolute hit was in the form of a redemption. A lucky commenter on this review will have a chance to win it! As for the rest of the hits available, there are many... and many unique hits to be found as well. Absolute is always loaded with sweet things to find, and this year is no different. I have to say that Absolute delivers again. This long established brand is familiar to collectors - and collectors love that. They know what to expect from it, and brings it to the table... but even more so! Though Absolute is a legacy-type brand, it has not sat around on its heels. This year's version has upped its game. Absolute is a not a cheap product. It is currently a little over $100 per box, so it's a bit on the higher-end. If you can get it, I would because it's one of the most fun breaks you can do. You'll be dazzled by the shiny foil, the textured inserts, and of course the great hits to be found. The only drawback of Absolute is the amount of sticker autographs in the product. I think that's what holds Absolute a little back from being a hugely monstrous product... but for now... it's the best football collectors can get! Nice cards. I feel that football just look a little better this year than the hockey cards. Nothing replaces hockey cards for me though. Really like the design of the base cards as ell as the Hogg Heaven cards. The only thing I don't like is that on the base cards, their heads are cut off at the top. Great review! I think this is the best Absolute they have ever done. The rps rookies are done very good and they have some crazy patches. Overall Great box. Very nice break! John Bostic looks nice if you want to get rid of that let me know! Nice cards, Good box. Really like this years product, Most boxes are actually good ones! Its a nice clean looking set of cards. I am a fan of it for sure. 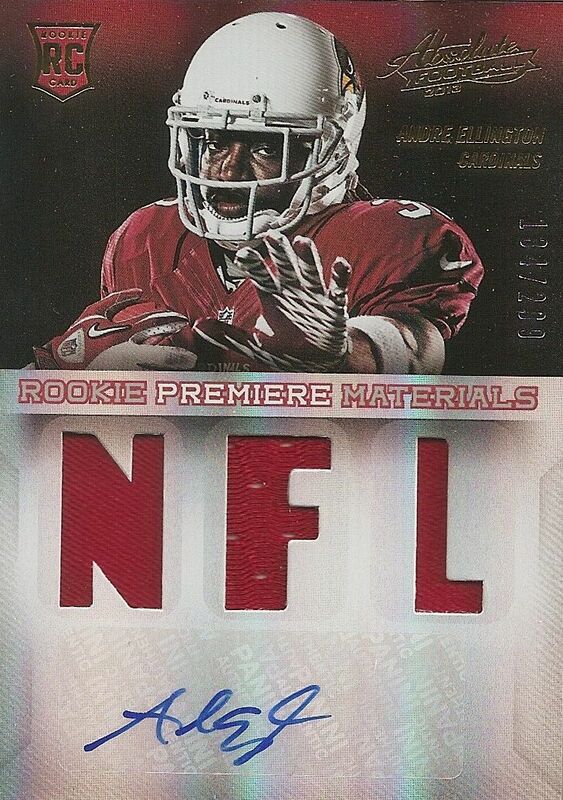 The only thing I don't like is the Rookie Premiere Jersey card that the NFL cut out looks horrible and so cheap. I don't know if that's what it looks like in person or if the scan didn't come out good. But it looks like a 5 year old did it. 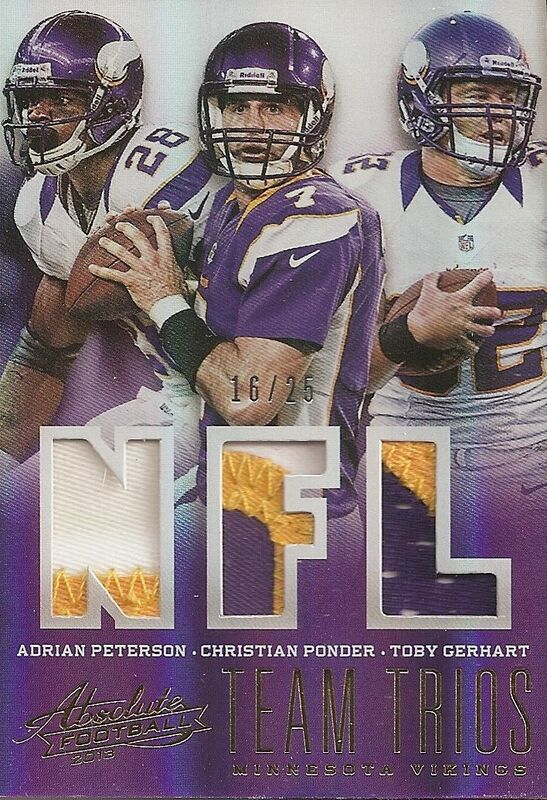 The other NFL cut out the Team Trios is a beautiful card. It looks clean and crisp. I love the design of the hogg heaven cards but not a big fan of the rest. + Cool design to many sets, especially the base cards, with a great combination of photos and the foil. - In my opinion the name of the player shouldn't be that big in the centre of the cards.